Liberian mothers receive family planning information when they bring their children to be immunized as part of an integrated approach. Kpaiyea, Liberia—In past years, women who had recently given birth would travel to the small clinic in this rural, hard-to-reach spot in Lofa County, carrying their infants swaddled on their backs. However, if they wanted a family planning method to prevent an unwanted pregnancy, they were often out of luck. It wasn’t customary to offer family planning. But thanks to a Jhpiego-supported integrated family planning project, Zubawuo has learned the benefits of family planning for postpartum women and has changed her practices. The U.S. Agency for International Development’s global Maternal and Child Health Integrated Program (MCHIP), which is led by Jhpiego, is funding this project in collaboration with the Liberian government. The objective is to give women access to same-day postpartum family planning services when they come to a health clinic for routine child immunization services. As a maternal health issue, postpartum family planning (PPFP) is crucial because pregnancies during the first year after childbirth hold the greatest risk for the mother and her baby. This time period also presents the greatest number of opportunities for contact between new mothers and health care providers. This innovative “no missed opportunity” approach makes sense in a country where, the 2007 Liberia Demographic and Health Survey reports, only 11 percent of women of childbearing age use contraceptives, the unmet need for contraceptives is 36 percent and by the age of 18 years, 48 percent of Liberian girls have begun childbearing. And, this percentage could be higher in some counties. In Lofa County, the need for family planning services appears to be great because, according to the UN 2008 Common Country Survey, the county had a teenage pregnancy rate of more than 68 percent. Given that 25 percent of deaths among all women of childbearing age are associated with maternal complications, consistent access to family planning services can indeed save lives. To that end, MCHIP’s priority is to increase access to and use of quality family planning counseling and services in Liberia. In 2009, at the request of the Ministry of Health and Social Welfare, MCHIP began scaling up evidence-based, high-impact maternal, newborn and child health interventions, with a focus on reproductive health and family planning. In February 2011, MCHIP initiated the family planning integrated project in collaboration with the health ministry. Here is how the program works: At the completion of each immunization visit, vaccinators use a simple job aid to share brief, targeted family planning messages with mothers and make referrals to same-day, co-located services. Job aids also help to reinforce the importance of the vaccinator reminding each woman about the return date for the next immunization visit. 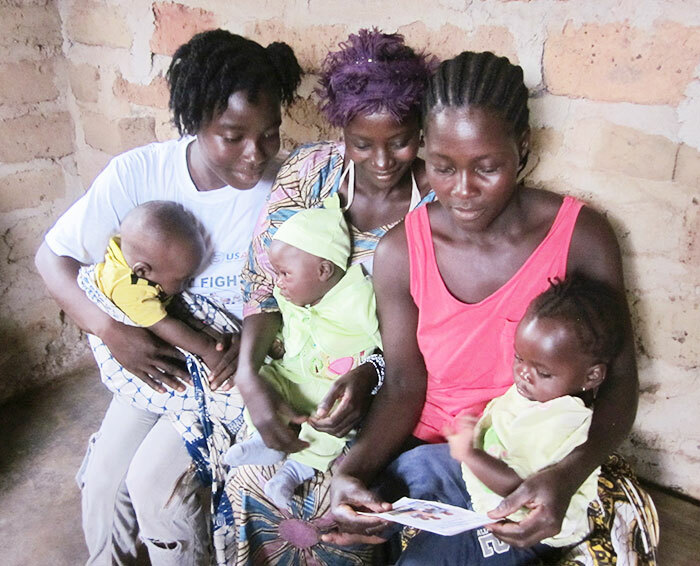 Women who are interested in seeking family planning services on the same day are given a referral card and guided toward the family planning room by the vaccinator. Family planning providers collect the card and document the referrals in their ledgers. They provide postpartum family planning counseling, and clients are able to select a suitable family planning method of their choice. Women who are not interested in seeking such services on the same day are given a leaflet with information about the benefits of family planning for the health of the mother, father and infant. They are encouraged to discuss family planning with their partner and/or family and return soon to the facility for family planning. MCHIP’s support to this intervention included initial training of vaccinators and midwives, ongoing supportive supervision visits and data collection for routine monitoring. An endline evaluation of the project was conducted in December 2012, analysis of the data is currently under way and findings will be disseminated in the coming months.